"So what's the deal with the two love birds in the back?" Amber Content has debuted a trailer for a film called Moon Dogs, which won Best International First Feature at Galway Film Fleadh 2016. No, this isn't an animated movie about dogs who go to the moon. Moon Dogs is about two teenage step-brothers, Michael and Thor, who take a road trip from Shetland to Glasgow for very different reasons. They're joined by an aspiring Irish singer named Caitlin, and if you can't already guess, things get heated when both boys fall for her. Jack Parry-Jones and Christy O’Donnell star, along with Tara Lee, Chris Donald, Tam Dean Burn, Tanya Franks, Geoffrey Newland, and Shauna Macdonald. This looks like a very odd, spunky, entertaining little coming-of-age film, which was nominated for a BAFTA Scotland last year. Check this out. A Celtic road trip following step-brothers Michael (Jack Parry-Jones) and Thor (Christy O'Donnell) as they journey from Shetland to Glasgow for very different reasons. Aspiring Irish singer Caitlin (Tara Lee) beguiles both boys and passions come to a head with a music festival and an ancient Norse ceremony as the backdrop. Moon Dogs is directed by Welsh filmmaker Philip John, making his feature directorial debut after extensive TV work and short films previously. The screenplay is written by Derek Boyle and Raymond Friel. This first premiered at the Edinburgh Film Festival last year, and also played at the Warsaw and Newport Beach Film Festivals. 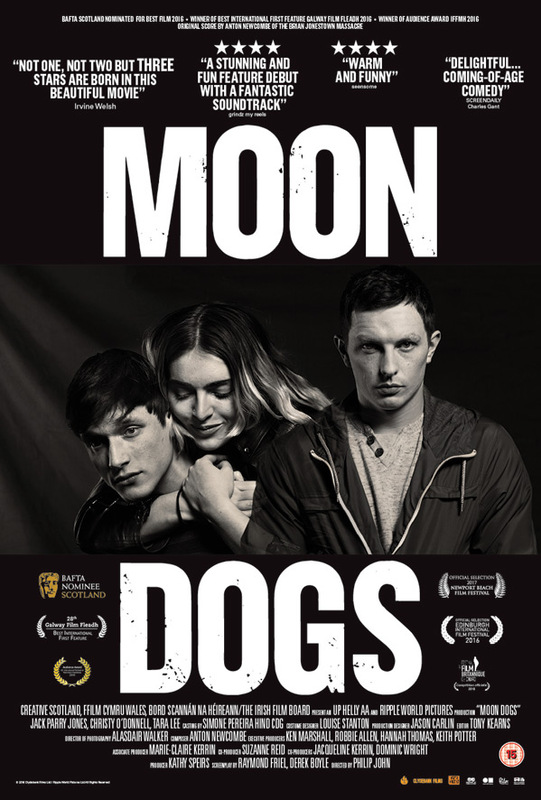 Amber Content releases Moon Dogs in UK theaters starting September 1st this fall, but the film doesn't have a US distributor or any US release date set yet. Is anyone interested?